My girls take a snack to school every day, and it’s turned into a struggle. If they had their druthers, they’d happily eat nothing but yogurt-in-a-tube or Swedish fish every day of their lives, but, unfortunately for them, they don’t have their druthers. They have mine. They’ll take fruit to school, but only if they don’t have to bite into it (“We don’t have time for all that!” they wail). They’ll ask for a bag of Doritos, and I just laugh and laugh (“But [insert classmate’s name here] [and here] [and here] always gets to pack Doritos! Why can’t we?” they weep). And then finally I give up and throw some pretzels at them and tell them if they don’t like it, they don’t have to eat it, but that’s a waste of food and sorry, no, I don’t think your teachers would really appreciate if I gave you a Snickers bar before your spelling test. I’ve made these recently, and the kiddos like them, especially once I subbed in a topping of a little cinnamon and brown sugar for the oats the original recipe suggested (picking my battles, friends). 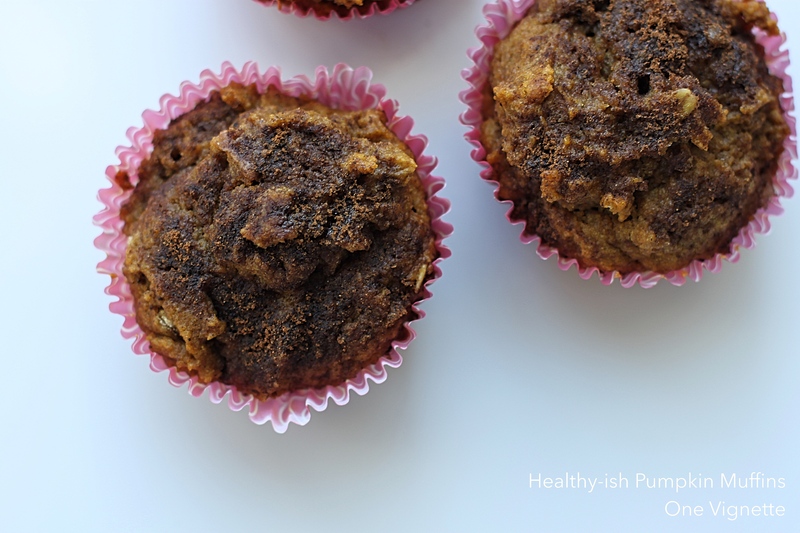 I call them healthy-ish pumpkin muffins because there’s still enough sugar in these suckers (via honey or maple syrup) to pass as your standard, good ol’-fashioned, no-kids-honestly-they’re-junk-food muffins. Trust me. If I can fool ’em, you can, too. Preheat oven to 325º F. Grease cups of a muffin tin or line with paper liners. In a large bowl, beat the oil and maple syrup or honey together with a whisk. Add the eggs and beat well. Whisk in the pumpkin purée and milk. Whisk in the baking soda, vanilla extract, salt, 1/2 tsp. cinnamon, ginger, nutmeg and allspice. Add the flour and oats to the bowl and mix with a large spoon, just until combined. Divide the batter evenly between the muffin cups. You should be able to fill each cup at least three-fourths full. In a small bowl, mix brown sugar and remaining cinnamon together. Sprinkle the mixture evenly on the tops of the muffins. Bake for 22 to 25 minutes, or until a toothpick inserted into a muffin comes out clean. 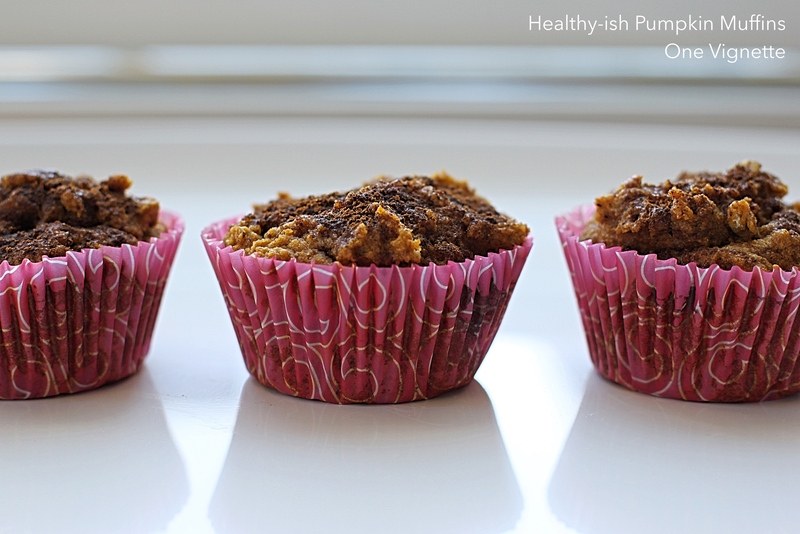 Keep muffins at room temperature for 2 days, or in the freezer for up to three months. Distribute freely among children for school snacks and parents for afternoon coffee breaks. * This recipe is easily doubled–just use one entire can of pumpkin purée. ** I used whole, but coconut milk would work well, here, too. You can also try almond or cashew milk if you’re dairy-free. *** Consider mixing some add-ins to change things up. Try 3/4-1 cup of shredded unsweetened coconut, chocolate chips, or chopped walnuts or pecans. Any of these would be a nice substitute for the brown sugar/cinnamon topping, too.